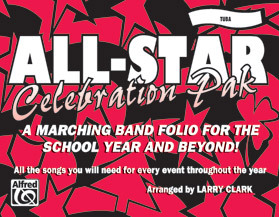 A collection of short arrangements written for marching band and/or pep band (note synthesizer, electric bass and drumset parts) geared for any event at which short, rhythmic and dynamic arrangements are used. 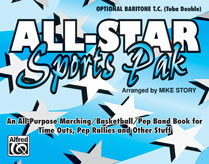 Easy and full-sounding mini-charts all arranged by Mike Story are printed in a convenient lyre-size book. Contents: Sweet Georgia Brown * Tequila * Wipe Out * Ghostbusters * I Get Around * Fun, Fun, Fun * The Lion Sleeps Tonight * Jeopardy Theme * Smoke on the Water * Proud Mary * Peter Gunn * Old Time Rock & Roll * Mighty Morphin Power Rangers * The Magnificent Seven * Batman Theme * Sing, Sing, Sing * Cheer Pax * The Star Spangled Banner.